This weekend I've been experimenting with fake cheeses and meats. 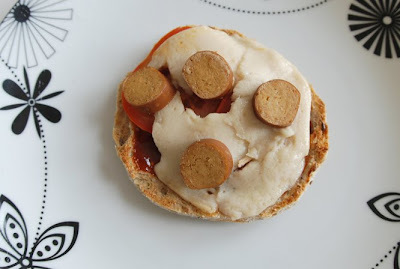 I decided to make some mini pizzas out of pitta breads, cut in half, smothered in BBQ sauce, then topped with tomatoes, fake Taifun Tofu Weiner pepperoni slices and Cheezly Mozzerella style fake cheese. I remember trying fake cheese a long time ago, back when I was vegan first time around, in university... it was disgusting. However, I'm much more of a foodie now and thought I'd give it another go to see how my tastebuds would react: verdict = positive! Cheezly really does melt like real cheese, I also prefer it to real cheese as it's not as strong tasting or as stringy, so it's not overpowering and it's soft and easy to eat. I was unsure of how long to actually cook it, so I think my first pizza was a bit undercooked, but it was still melty and really delicious. I've included a close-up photo of my second pizza, and you can see that the cheese has gone bubbly and slightly browner, like real cheese does. However, it was horrible when it was uncooked, straight out of the packet. I don't think I could bring myself to eat any fake cheese product which hasn't been cooked. I think this is what may have put me off fake cheeses when I was back in university! I'll definitely be using this again, but I won't be keeping it as a staple item in my fridge, because I simply don't see the need to eat replacement products all the time. I haven't used the Vegi Deli Chicken Style Pieces yet, but have had them before and they are really nice in stir fries. I was going to put them on a pitta pizza, but just decided to stick with the pepperoni in the end. 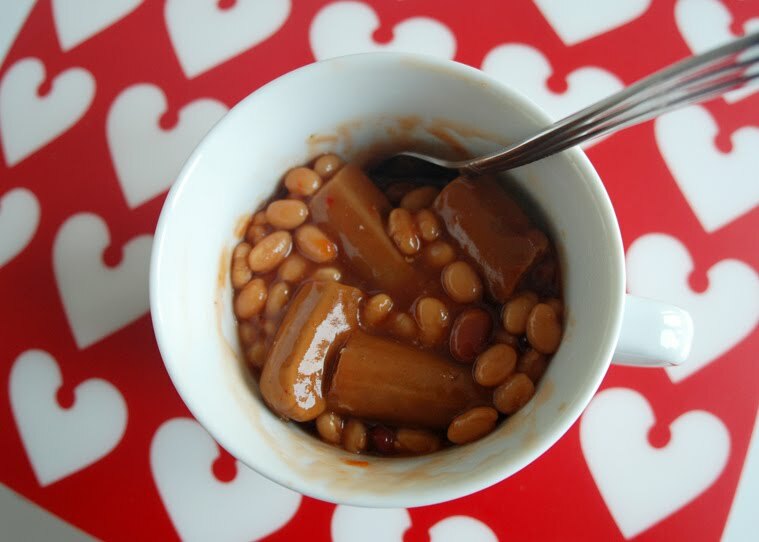 Another quick thing to do with the Tofu Sausages is chop them up and put them in BBQ Baked Beans and heat them for a minute... it's really nice for a super-rushed breakfast, and they taste so much better than the real canned mini hotdogs in baked beans. In fact I'd definitely say these babies taste almost exactly like real hotdogs. The over-processed, soft texture is exactly spot on, and they taste smoky too, like the real thing... but better! I picked up some more noodles from the Asian market as well this weekend, as I want to make mixed vegetable Ramen soup again this week. I could spend forever looking at all the different types of noodles in their crazy, bright packaging. There are rows upon rows of them in our Asian market, and they're all so cheap at around 35-40c each! I opted for the Mama Artificial Chicken flavoured noodles that I got last time, as they were good, as well as Mama's rice noodles. I had these the other day for a quick snack and I was NOT impressed. I always put all the flavouring in straight away, but there was something funny tasting about these ones, and the chilli powder burnt the roof off my mouth!! I had to wash some of the flavouring off, it was that bad. I suppose I should have checked the taste as I was adding it, but most of the time it's fine so I really didn't think to check. I won't be getting these again. I also picked up some artificial chicken flavoured Pho Ga noodles. These must be my favourite instant noodles of all time. Yes, a bold statement to make, but they are really that good! 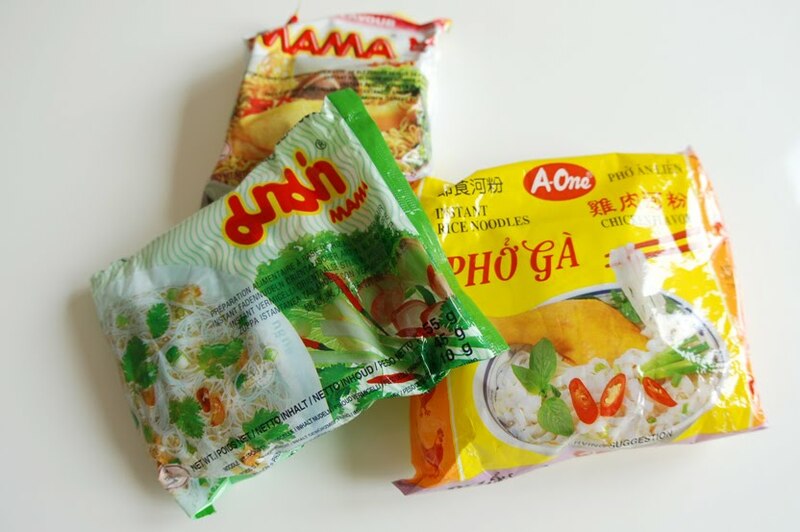 They are super-thin and flat rice noodles and you get a really decent amount of flavouring, herbs and garlic oil included in the packet. I remember eating these exact ones as a student in Bristol and was really excited to discover that our Asian market stocked the same ones. I should have picked up more! I have been searching for another flavour that I used to love, but I haven't been able to find it yet. I remember it being bright reddy-pink and I think it may have been pickled cabbage flavour, or something like that. Sounds revolting, but it was sooo good! Ive looked at those weiners but wasnt sure on buying them as they seem expensive to me. 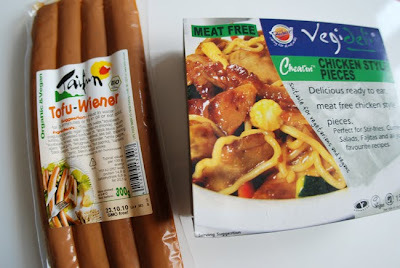 have you tried any of the other taifun tofu sausages? How do they compare to the weiners? 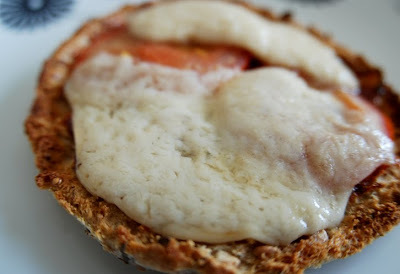 I agree with you about the cheeses, i am not that keen on eating straight from packet but really nice on pizza, toasted cheese etc.. I have heard that there is one cheese that is coming to my local deli called "Mr Cow", it's cashew nut based and meant to be amazing! so can't wait to try it. there's also another one that should be coming from America called "Daiya" and meant to be a great melter. I love those tofu weiners soooo much and Katie they are well worth the money. I tried the herb ones that are smaller and not nearly as nice as these. Defo a must try! Katie: They are quite expensive, but I do like them! They were the same price as the smaller sausages (about 150g) and they were 300g, so I decided to go for the larger ones even though I wanted small ones... I've never tried any other taifun products, I don't think. just had a thought though... how would the cheese be in the post?? Would it go off? Maybe if it's made from nuts it will be ok! oh yeah i never thought! Once it comes i will check it out and let you know. Hmmm, it might be ok if it's made from nuts. I had the soya Cheezly in my bag for most of the day, in the sun, and it was fine when I got home after an impromptu night out until 3am!! 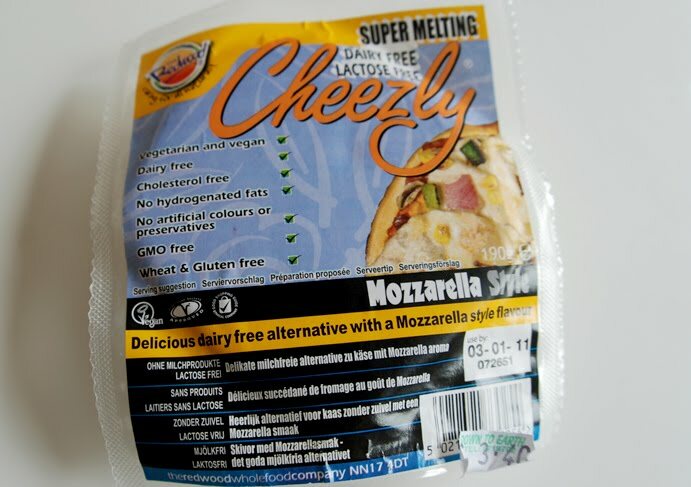 No sign of melting or going off at all, so I'd imagine the Cheezly could go a couple days easily out of the fridge as it's vacuum packed so well. Hopefully the cashew cheese will be similar! Oh my god yes I haven't had a cheese-board in so long! My boyfriend sits there with a massive plate of cheese and all sorts of chutneys and cranberry sauce at Christmas, and I do miss doing that. Even the sociability of it all. Last Christmas though, I bought some tofutti cream cheese to have on crackers with cranberry sauce. 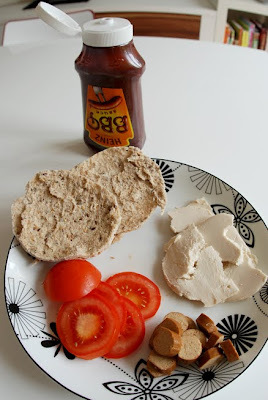 I was never a big fan of cheese spreads but I did like it, for the fact that I hadn't had anything like cheese in a long time, and it did go really well with the cranberry and it was nice to join in with the boyfriend! He tasted some and really liked it too, and admitted it was pretty much almost the same as normal dairy cream cheese. That made me really sad because if HE could be satisfied with the fake cream cheese I'm sure a lot of people could be - then there wouldn't be a need for dairy cream cheese any more. Everyone is so used to dairy now though, that substitutes taste really weird for a while and "not as good" as their dairy counterparts. So they give up too easily and go back to dairy. I think though, if we were raised on soya products, then DAIRY would be what tasted weird and too strong/icky. As for products that are UK only and hard to get in Ireland, well I'm from the UK originally (Wales) so I do go back quite often and do get to pick up a few products that we can't get in Ireland. I can't think of anything offhand that I'd like to try though! The cashew cheese would do me fine! Although if it helps, we don't have Sainsbury's, Co-Op, Asda or Waitrose here in the Republic of Ireland, so any of their own-brand vegan products wouldn't be available here. It's really funny but your boyfriend sounds exactly like mine!! it frustrates me so much! He eats meat too, so some times it's really hard! he doesnt really understand my vegan diet, so sometimes he drives me mental too especially when he buys me a pizza and he doesn't understand why i am not eating it ahhhhhh. Since being a vegan i have become so sensitive to foods. When my boyfriend is cooking a pizza, all i can smell is sour cheese and it's horrible. Also today i passed my dad who was eating cows yoghurt and it really smelt strong and sour. I think as you say everyone is just so used to dairy and if they gave vegan substitutes a chance they would adjust their tastes and love it. Yes it's annoying we don't have those supermarkets, but we do have Tesco, Aldi, Lidl, M&S... then Irish specific supermarkets like Superquinn and Supervalu. Oh and we don't have Morrison's either! I know exactly what you mean about the smell of cheese, in fact it happened just yesterday to me, funnily enough. I've never ever noticed it before, but someone heated their lunch up at work in the microwave and it made me feel really ill, it smelt so rotten and foul! Then I realised to most people it would actually be a normal cheesy nice smell. i honestly believe a lot of people know, but don't want to know if you know what i mean lol. they turn a blind eye. If only they knew what they were eating and what it is doing to their bodies! 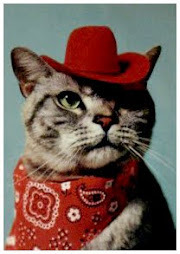 I know i wish i had loads of comments - nobody looks at my blog i don't think lol.